As an artist Jhane Myers (Comanche/ Blackfeet) was selected as one of the featured fine artists for the first ever Comanche Fine Artist calendar for 2016. She also made her acting debut in an indie film called Bare (2015). Continuing in film she enjoyed being an Associate Producer on the PBS documentary La Donna Harris: Indian 101 (2014). She was honored to be an Artist in Business leadership fellowship recipient for 2015 and one of four First People’s Fund Cultural Capital Fellows for 2014. She also won a Best of Show and 1st place for her son’s chicken dance regalia during the 92nd Annual Santa Fe Indian Market Clothing Contest 2013. She has won (6) 1st place awards, including (2) Best of Show in the Native American Clothing Contest, at the 86th- and 87th Annual Indian Market in Santa Fe., 2007-08. Jhane was featured on the cover of the July/August 2008 issue of Native Peoples magazine and her work was featured on both the 2011 SWAIA Indian Market official guide and yearbook. She garnered the Heard Museum Guild 2010 Indian Fair and Market Best of Show, Best of Class and Division 1st place on a collaborative marionette titled ‘Coyote as Champion’ . The work has been featured in the May 2010 edition of the Western Art Collector magazine. Jhane’s work is in the Smithsonian’s National Museum of the American Indian, D.C and NYC, the Wheelwright Museum, the Indian Craft Shop D.C., the Autry Museum, Comanche Visitors Center and the Blackfeet Heritage Center. Most recently guest speaking as an artist to the Museum of Indian Art & Culture ‘s Friends of Indian Art in July 2013. She now works as the first Native Film & Special Projects Director at the Musuem Of Indian Art & Culture under the legendary Director, Della Warrior. She is currently featured along with 17 other artists in the new book titled Contemporary Native American Artists (2012 Deats-Leaken). She was also a Community Curator to the Smithsonian’s National Museum of the American Indian’s popular exhibition and book “Identity by Design,” currently with her beadwork on loan to the Eiteljorg Museum (2013) . Jhane is a noted fourth generation dressmaker, third generation doll maker. beadworker and traditional regalia designer. Hailing from the Penetuckah (sugar eater) and Yaparucah (root eater) bands of the Comanche Nation, Myers has achieved equal recognition as a World Champion dancer of the Southern Buckskin category of the highest caliber. True to her commitment to Native art and artists she proudly serves as the Vice Chair of the Comanche National Museum Board of Directors (2010-2016) for a second term. She is also the Native Cinema Showcase Project Manager for NMAI/ SWAIA’s Classification X (2012-2015). She has served as a three year Chair for the Native American Clothing Contest during the Southwestern Association for Indian Arts (SWAIA) for its 88thand 90th Annual Santa Fe Indian Market in August 2009-11. Jhane made history as the founding Executive Director of the American Indian National Center for Television and Film. The Institute of American Indian Arts (IAIA) formed the Center in Los Angeles with network partners Disney/ABC, CBS, NBC/Universal and FOX to increase the representation and visibility of American Indian talent in all aspects of the entertainment industry. 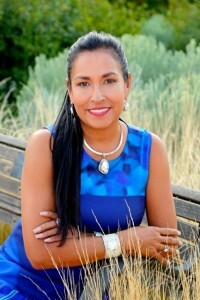 She has also served as publisher and editor-in-chief of Oklahoma Casinos & Entertainment magazine, a motion picture publicist and directed her own public relations agency, Jhane Myers & Associates and has worked as a publicist to Mel Gibson on Apocalypto which included organizing the premier at The Riverwind Casino in Oklahoma. Former positions include the Director of American Indian projects for the Oklahoma Centennial Commission, Festival Director of Red Earth Inc and a Senior Account Executive for the New York based Ralph Lauren Fragrance Division. As a two term Chair of the American Indian Chamber of Commerce of Oklahoma City and the Student of Excellence Awards Jhane always serves her local Native community Former board memberships include the Native American Heritage Celebration at the Capitol sponsored by the Oklahoma DHS Civil Rights Division, the Oklahoma Lupus Foundation and the Oklahoma Juvenile Diabetes Foundation. She had memberships in the following organizations; Oklahoma Federation of Indian Women and the National Indian Women’s Association. In 2008, Jhane was the honored for her dedication to the positive image of Native people with a Lifetime Achievement Award by the Oklahoma Indian Gaming Association and in 2004 was the recipient of the Woman of Distinction award sponsored by the Girl Scout Redlands Council.